The American Team of German Rocket Scientists (also the Von Braun German Rocket Team) are shown above at White Sands Proving Ground in New Mexico in 1946. This web site is dedicated to them and the other German scientists that have contributed so much. Over 3,500 German scientists became American citizen. For most this was a dream come true. They all loved America, their new home, and the new friends they made. In contrast, 6,000 "Specialists" (a total of 20,000 people) were taken to Russia. However, the Germans rocket scientists that went to Russia loved the Russian country and its people. However, living conditions were not what they had been used to in Germany. As such, the ones that survived, returned to their country of birth. 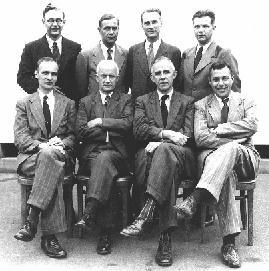 Below are 8 of the 12 German scientists that came to Point Mugu, CA to the Naval Air Missile Test Center in 1947 under "Operation Paperclip." Click here for a list of 1,600 German rocket scientists in 1947. Standing from left to right; Wilfried H. Hell, Dr. Herbert A. Wagner, W. Hohenner, and Edgar W. Kutzscher. Front row; Reinhard N. Lahde, Dr. Ernst O.H. Friedrich, Dr. Hans E. Hollmann and Theodore Sturm. Not shown are Robert Lusser, Willy Fiedler and Otto Schwede. Not only did the German scientists contribute with their creativity and ingenuity to the world economy, but German ideas, patents, technology and secrets were made available to all. See "Secrets By The Thousands," Harper's Magazine. October 1946.